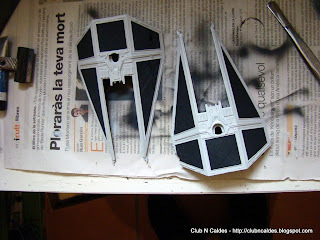 Last step for the TIE Interceptor. 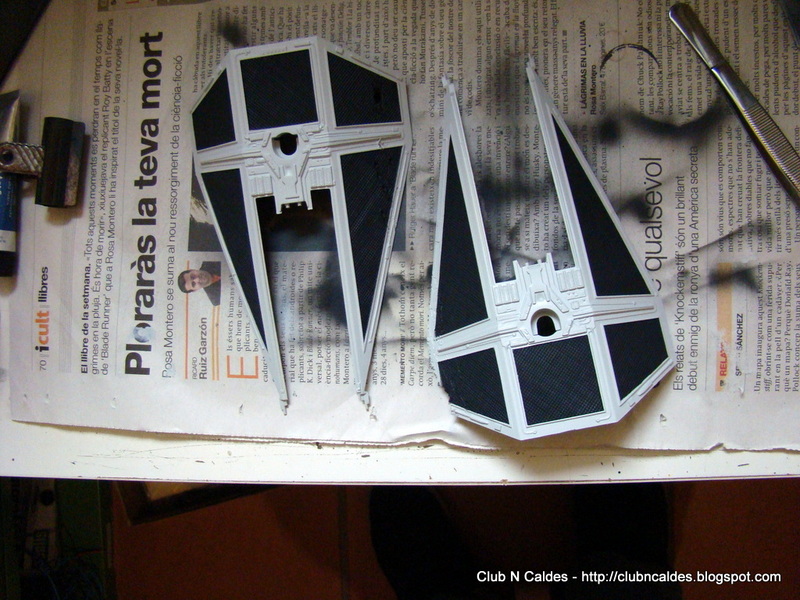 I used a mix of 50% White and 50% Light Gray from Model Air Color, an airbrush special line of paints of Acrílicos Vallejo. With this mix I airbrushed the entire model. I didn't use any primer because it's a very small model with thin details and I don't want to loose them with too much paint layers. After this base color, take the needed time to mask perfectly both wings. Make sure the edge of the masking tape is well stuck to have well defined edge lines. Cockpit has been sealed with Tamiya plaster and sanded before painting. With a soldering iron I reproduced a kind of blaster hits along one of the wings and with a thin electronic pliers (green one, in the photo) I cut the back part in one side of the wings simulating a hit with another ship doing multiple small cuts in different angles. First step of weathering has been done with black oil paint diluted in turpentine, and applying it in all the edges, panel lines and small details. 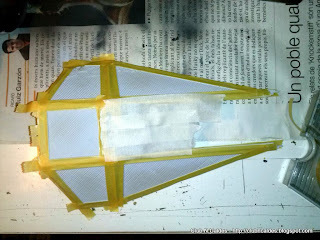 Remember to dampen first the plastic parts with turpentine. Using cotton sticks dampened also with turpentine clean the parts where the black oil paint has been applied until it has the appearance you are looking for. Cockpit has been also weathered doing another kind of wash with oils. You can take several colors of your choice, in my case white, yellow and brown, and make small drops. Then take a plain brush dampened in turpentine and slide those dots from the front to the rear mixing the colors until they are almost imperceptible. This will give a variety of tonalities that will break the uniformity of the color despite you think you cannot see them. 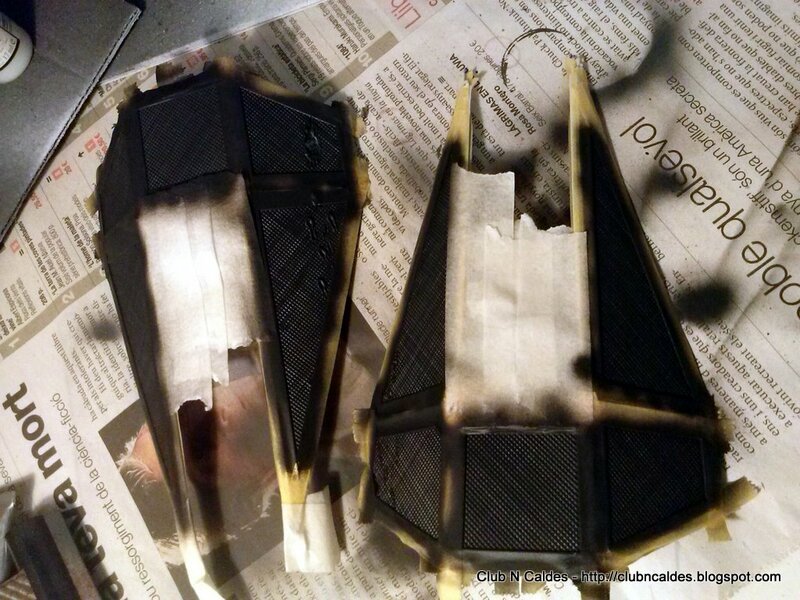 The edge of scratches and hits have been painted with metallic steel, and after I applied black pigment. Drill a small hole in the clear base, next to the foot stand, for the wires. In this way they will be quite hidden. Next one will be the Y-Wing, hope each one will be better! !